Recent studies indicate that treatment of canine periodontal disease may not resolve the attendant inflammation, which means negative repercusions may continue for some time (Rawlinson et al., 2011). The only dependable method is to try and prevent onset of the disease in the first place. I can’t stress this enough … for the most part, periodontal disease is preventable! I strongly encourage you to make canine dental care a top priority at an early age. 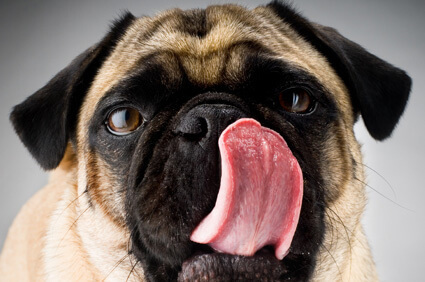 Your efforts will be rewarded, as proper dental can improve your dog’s chances of long-term health. Riggio MP, Lennon A, Taylor DJ, Bennett D. Molecular identification of bacteria associated with canine periodontal disease. Vet Microbiol. 2011 Jun 2;150(3-4):394-400. Epub 2011 Mar 10. Rawlinson JE, Goldstein RE, Reiter AM, Attwater DZ, Harvey CE. Association of periodontal disease with systemic health indices in dogs and the systemic response to treatment of periodontal disease. J Am Vet Med Assoc. 2011 Mar 1;238(5):601-9. Glickman LT, Glickman NW, Moore GE, Lund EM, Lantz GC, Pressler BM. Association between chronic azotemic kidney disease and the severity of periodontal disease in dogs. Prev Vet Med. 2011 May 1;99(2-4):193-200. Epub 2011 Feb 23. Glickman LT, Glickman NW, Moore GE, Goldstein GS, Lewis HB. Evaluation of the risk of endocarditis and other cardiovascular events on the basis of the severity of periodontal disease in dogs. J Am Vet Med Assoc. 2009 Feb 15;234(4):486-94. Beard G, Emily P, Milligan & Williams C: American Animal Hospital Association, Veterinary Dentistry, Course I, 1989. The dental treats have made a huge difference in our dog's breath - they get a treat in the am and pm and it keeps their breath smelling fresh! Thanks for the very educational and helpful information. I loved your post. I have 3 cats and I am always looking for tips to make my little cat happy. Great list! Congratulations all of you.